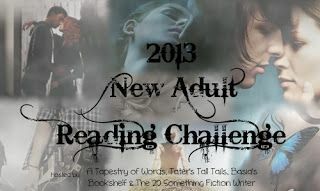 2013 Reading Challenge, What Are You Reading? Happy New Year! And with the new year come all the new hopes, dreams, promises, and challenges that only a new year can inspire! And every year I participate in a new reading challenge. I find it is a great way to keep track of my "to be read" lists. This year I signed up for three challenges as well as my usual Goodreads challenge. The hosted challenges are a great way of finding new books, participating in the chat forums, and again, keeping track of your challenges. I am completely organized this year with a 2013 Reading Challenge page, 2013 Book Review page, and a 2013 Reading Challenge shelf on Goodreads. Challenges can be big or small, the size is not important. What's important is that you set a realistic goal for yourself and have fun doing it. Read for the enjoyment and happiness a story brings you. Post a review of what you love. And share your challenges with us. I always love seeing what everyone is reading. It is a fun way to get some really fantastic rec's. Good luck to me and to you!! Oh I love this for sure! Some good picks up! Gabriel's Rapture by Sylvain Reynard is one I am putting on my list as well!